Are you getting married and want an explanation of why a wedding garter is part of the wedding tradition? Garters have been worn for hundreds of years... And the tradition of wearing a ‘wedding garter’ has been part of the UK’s rich history, passed down through generations with 85% of brides carrying on with the tradition and the ‘something blue’ superstition as an essential part of their wedding. The purpose of a wedding garter was traditionally to hold up stockings, there was no elastic until 1820 and even then it was mainly used for fastenings on gloves etc. Stockings were knitted in 'stocking stitch' giving a smooth finish, the tops were knitted in 'garter stitch' which is less likely to curl over, but has no real elasticity. Garters were made of ribbon and tied tightly around the leg at the top of the stocking to keep the leg of the stocking smooth. Ouch! it doesn't sound comfortable at all! Can you imagine it's 1733, 'flinging the stocking' was a favourite wedding chamber sport: Yes, in the 'Honeymoon suite' unmarried men seized the bride's stockings and single girls the groom's, each group took it in turns to sit at the bottom of the bed and in turn to toss the stockings over their heads to fall, on the bridegroom if thrown by a girl, on the bride if thrown by a man. Success was meant to indicate an early marriage for the young person. Till in sack-posset they had lost it. Throwing the garter and bouquet are believed to be direct descendants of 'flinging the stocking'. Moving on to the 1800's, it was customary for the bride to toss her garter to the male guest who had won the 'race for the garter' (from the church to the bridehouse). But frequently the men got too drunk and would become impatient and try to remove the garter ahead of time. Later in Victorian times, in the interests of decorum the custom in the UK changed to tossing the bridal bouquet. Tossing the garter has been revived in America, where two garters will be bought one to toss and one to keep. Do Brides Still Wear a Wedding Garter? Can I Still Wear a Garter? Which leg do I wear a garter on? Again this is totally up to you, but if you intend having a garter photo, just 4" above the knee is good...If you're holding up a large skirt for your photo, you can't always see from your position quite how much you're showing off! If you don't intend having a garter photo, just wear it wherever you feel comfortable. Who Should Buy the Wedding Garter? There is confusion between terms suspender belt, garter belt and a garter...A suspender belt, translates into French 'port-jarretelles' 'around the hips'. The US garter belt is worn around the waist or just above the hips. A garter is worn on the leg. It's usual in the UK just to have one wedding garter, in the USA where the garter toss is more common, two are usually bought as a set. An elaborate garter for the bride to keep as a keepsake and a simpler version to be tossed to the male guests... So you only need two garters if you're going to use one to throw. This isn't for everyone...you may choose to discreetly remove your own toss garter for your husband to throw, or you may decide to keep it for his eyes only, the choice is entirely yours! It's 'traditional' to have a garter... but personalise it and make it unique to you! The wedding veil was traditionally handed down through generations of the family's brides. In the USA the dress was also handed down and each bride would stitch her own wedding dress label inside, embroidered with the happy couples names and their wedding date. If you don't have something old, you can choose a vintage lace...take a look at our Ayana wedding garter right or the cotton lace 'vintage sparkle' wedding garter! 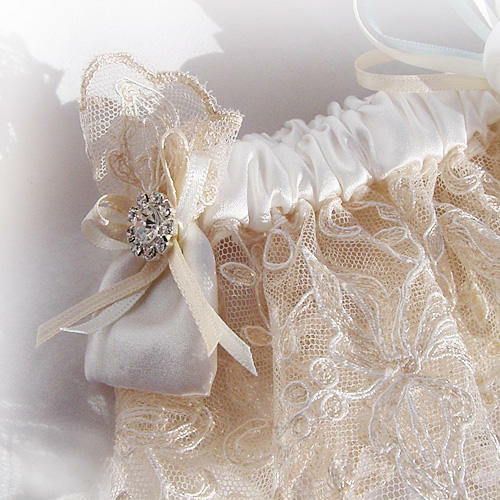 Fine vintage lace is placed over luxury satin, gently gathered and sprinkled with crystals. They can be custom made to your own colours or are available in blue or ivory from stock. Similar to the wedding dress labels, these beautiful personalised wedding garters are exclusive to www.silkgarters.co.uk. You can have your wedding garter embroidered with your names and date, or just your new married name. A lovely heirloom to keep for years to come and show your own children when it’s their turn to tie the knot! For something new, it is tradition for the bride to wear new unlaundered underwear, this is to emphasise their acceptance of a new life. Depending on your style of wedding dress beautiful bridal lingerie is sometimes best kept for the honeymoon... Whilst strapless moulded bra's and bodyshapers designed to fit smoothly under your bridal gown, in a wonderful range of skin tones from ebony to toffee and also bridal ivory and pure white, disappear under your wedding dress. Delightful wedding and honeymoon ranges of lingerie are available to order. Pictured is a blush pink garter set with a matching thong. A gorgeous gift in pure silk satin and cotton lace. The 'silver sixpence in her shoe' was to secure future wealth for the happy couple. If you dont fancy having a sixpence in your shoe, you can have a tiny bag addedto your choice of wedding garter with a genuine old sixpence piece inside! Yellow garters were thought to attract a partner, remember Malvolio in 'Twelfth Night', cross-gartered in yellow ribbons to attract Olivia? Well, in the 19th century, an obliging bride would wear a yellow garter placed there by a hopeful girl-friend, looking for a husband. This was to ensure marriage for the friend within the year. One Boston bride went to the alter wearing 7 yellow garters all from hopefull friends ! In 19th Century London postmen claimed a special meal allowance to sustain them during the Valentines postal rush! More red roses are bought at Valentines Day than at any other time of year. A custom said to have begun in France when Louis XV1 gave his Queen, Marie Antoinette red roses on 14th February. In a leap year women can traditionally propose to men. If rejected the girl can claim a compensatory silk gown!